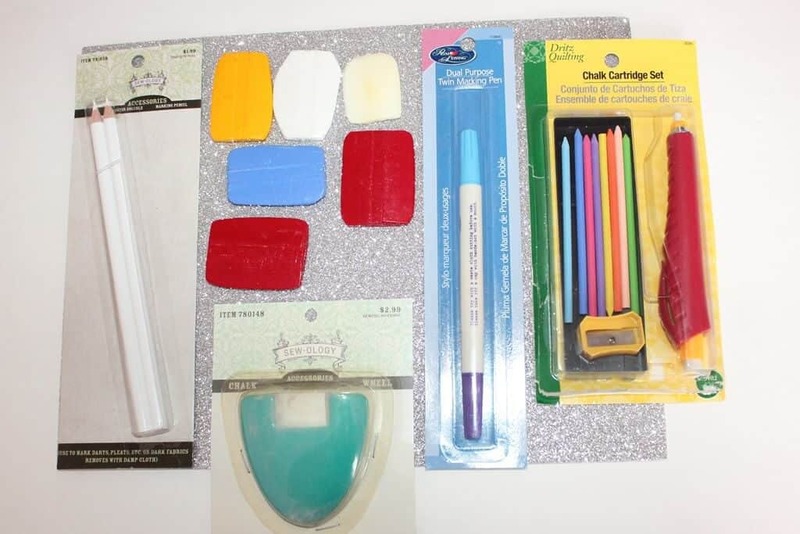 If you want to learn how to sew, you need proper sewing tools. And quite a lot of them. So, get busy gathering all the necessities required for the good start – and the kingdom is yours. Therefore, the first step in the process of learning to sew is going shopping for sewing supplies. It can be exciting and fun, especially that you don’t need to spend an awful lot of money. But there are 2 things that can spoil the fun: an overload of choices and the use of wrong criteria by which you are supposed to choose. I know this from experience. Just one example. Let’s open Amazon.com and put “sewing scissors” to search. It has 35, 596 results! And every choice on first few pages has hundreds of reviews. Now try to choose one that you will use. Do you want to spend hours of your life to read countless and often contradictory reviews and end up tired and grumpy avoiding making the decision? Of course, you don’t. 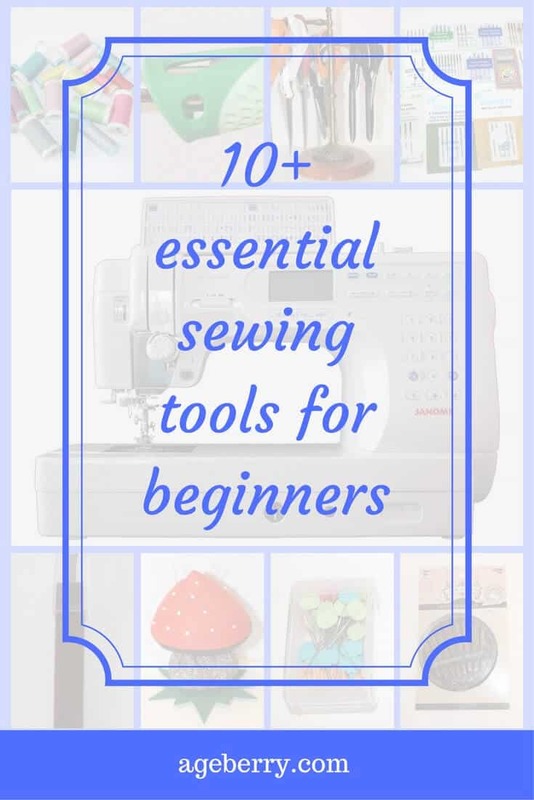 So, in this Guide, I will try to give you practical and experience-based information about how to choose sewing tools and put a limit on your options. Don’t focus on whether they are the best possible choices or not. You have to start with something. And after you use them you will see if these options are right for you. Also, people who sew tend to buy too many things they think they will use in the future. There are many jokes about this habit. Let me tell you one of them. 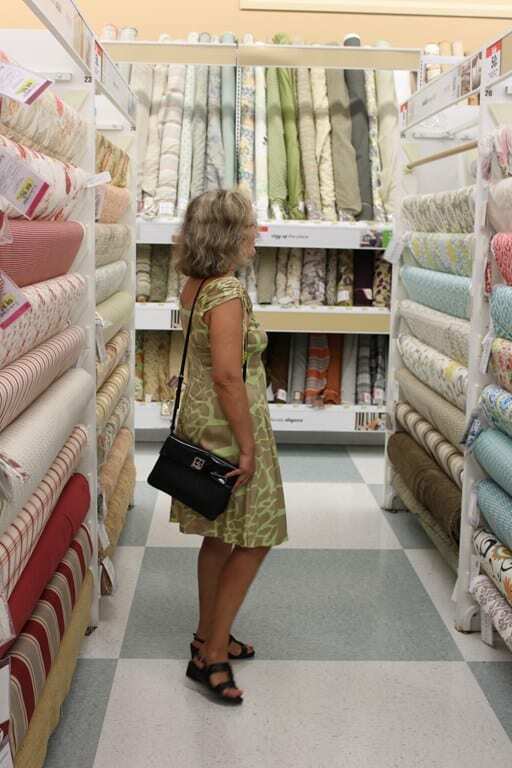 A woman enters a fabric store, and a sales associate comes to her and asks: How can I help you? She takes a quick look around and says: Please, help me to get out as soon as possible. But jokes aside, you will need to spend some money for your sewing tools. Your success or failure will depend on their characteristics and quality. The first thing you will need is a sewing machine, of course. There are hundreds of recommendations about what sewing machine you can use in the beginning of your sewing adventure. Let me add my modest contribution to this pile. A sewing machine is not just a tool, it will be your faithful assistant for many years if you are really serious about sewing. So it has to be convenient and reliable. It doesn’t have to be the latest model. Even the most common machine, performing a straight and zigzag stitch, in skillful hands is capable of doing everything. Well, what can I say, it is pink, and it can sew. I tried it. Do I like it? No! I feel like I am sewing with a tank. And it doesn’t have to be all metal. We are not going to use it for a bodybuilding. We are going to do a skill building. So never forget that your success depends on your skills, on how well you know how to use the machine, not on how much it costs and how many types of decorative stitches it can perform. Sewing is interesting, fascinating process but at the same time, it is a real work that requires great patience, attention to details, and desire to create something unique and beautiful. Any sewing machine of the well-known brand like Janome, Bernina, Brother, Singer, Pfaff is acceptable. But don’t buy it in a big chain store. Choose the brand that has a service center or a dealership in your city because you will have a warranty with them and they can offer service, maintenance and many perks ( like take your old machine back when you will want to upgrade ). Go there and try the machine; they will be happy to have you. Compare machines. Pay attention to how the machine starts, how smoothly it runs, look at the stitch quality and stitching options it has, ask the sellers to show you how it works before buying. Come back the next day and see if you still like the machine. You will need needles for your sewing machine. Most likely you will have some of them already among your machine accessories. I can say success or failure in sewing sometimes depends on the selection of the needle for the sewing machine. 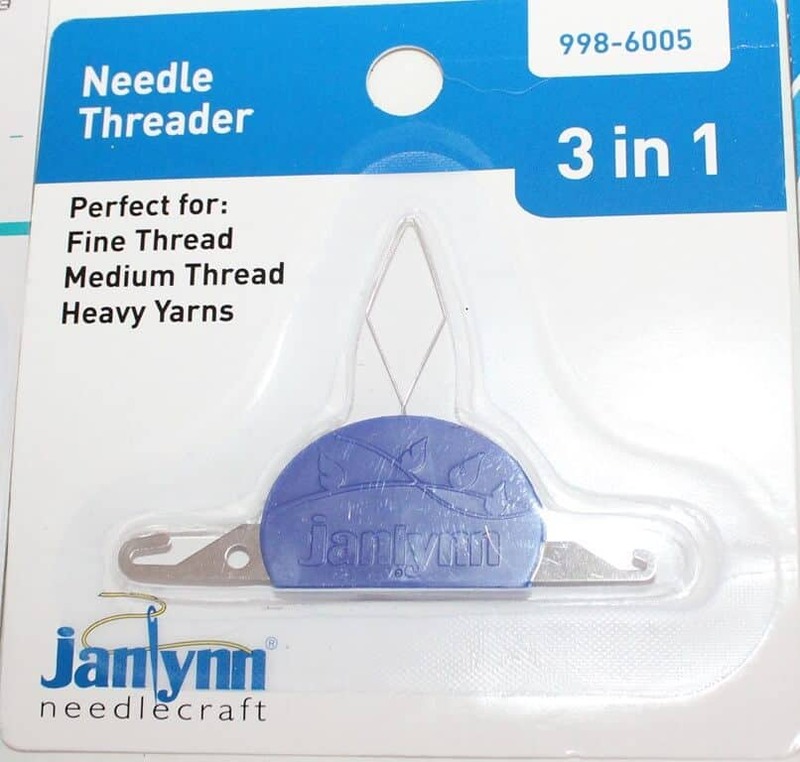 The type of needle and its thickness must match the fabric and the thread. The thinner the fabric, the smaller the needle number. Needles usually numbered with the two-number measuring system. The thinnest needles (No. 55/7 and 60/8) are used for sewing very thin fabric like silk chiffon for example. Needles No. 70/10, 80/12 and 90/14 are good for a great variety of fabrics (from lightweight to medium weight) and are the most used machine needles. And No. 100/16, 110/18 and 120/19 are good for heavyweight cloth like denim and coat fabric. There are many types of sewing machine needles (who would have thought): universal, ball point, denim, leather, embroidery, metallic, quilting, topstitch, microtex, twin (or double), triple, hemstitch, self-threading, etc. Universal needles, which are good for a variety of materials. 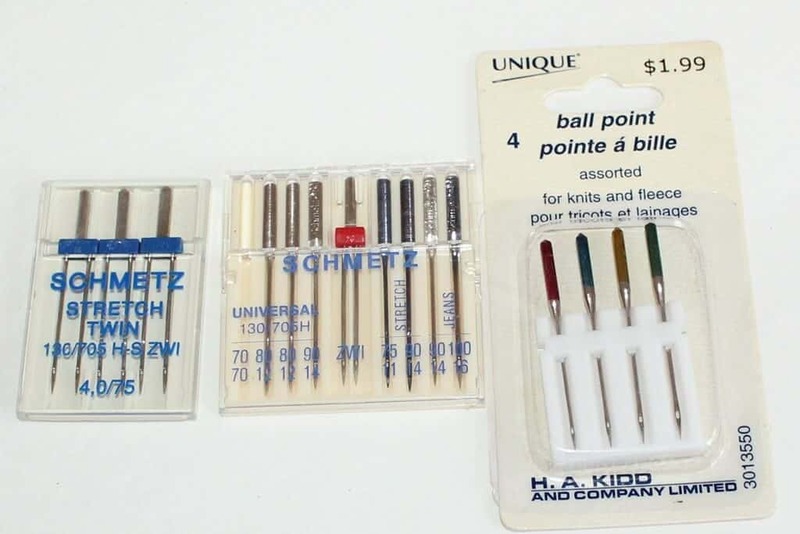 Ball point needles with a rounded end designed to avoid making holes in knits and stretchy or loosely woven materials. Twin needles – to perform decorative stitching (these needles create two parallel lines on the front side of the garment, and form a zigzag line on the back). Buy few packs of UNIVERSAL needles of different sizes, one pack of BALL POINT needles and one TWIN needle – and you are set. How often should you change the needle of your sewing machine? Well, it depends. Some tutorials say that you have to change the needle every time you start a new project. Others say – change it every four hours of work. And I would say that there is no simple answer. If your previous project was done with medium weight cotton, and you decide to sew lightweight silk, then you change the needle, period. But what do you do with the needle? Through it away? Or keep it in your pincushion for future use? I guess you can do both. If your previous project had only two seams – then keep the needle and use it for another project in the future. But if it was somewhat complicated sewing – then throw it away. The truth is, when you sew, the needle passes through the fabric hundreds (or thousands?) of times per minute, so the needle tip experiences very heavy loads and in time becomes bent or blunted. This leads to skipped stitches, broken threads, pulls in the fabric and even broken needle plates or bobbins. So the needles should be constantly monitored and the blunt needles replaced immediately. Needles are inexpensive and very easy to change. Keeping a good needle in your sewing machine is one of the easiest ways to perfect sewing projects. If you want to know more read this post by Debbie Colgrove (from www.thespruce.com) Everything You Need to Know About Sewing Machine Needles. You will also need needles for sewing by hand. 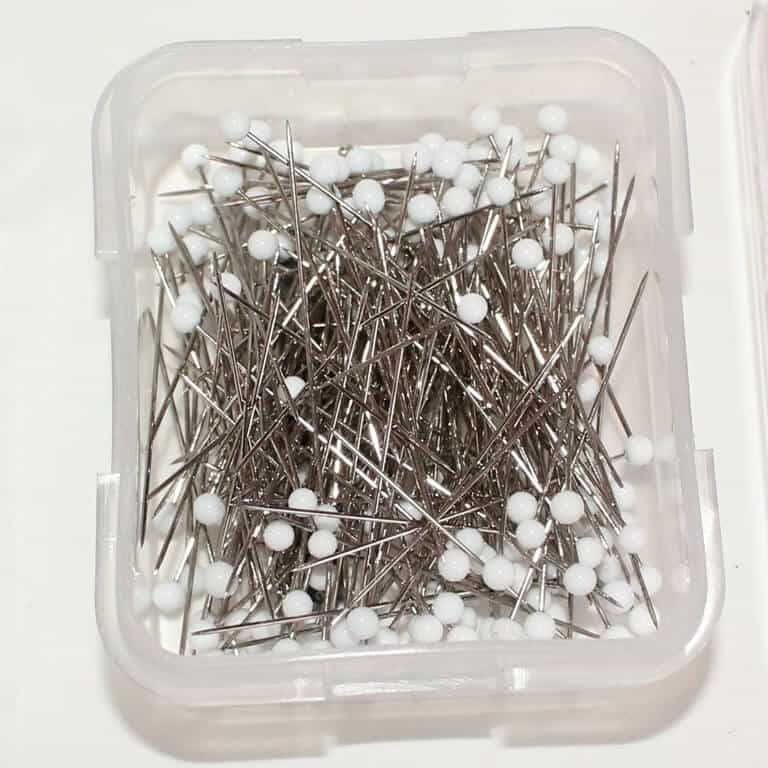 Experienced tailors have in their “arsenal” many kinds of hand sewing needles: thin, thick, short, long, with a small eye, with a big eye, with two eyes, for darning, for embroidery, for leather, etc. So what should you buy as a beginner? 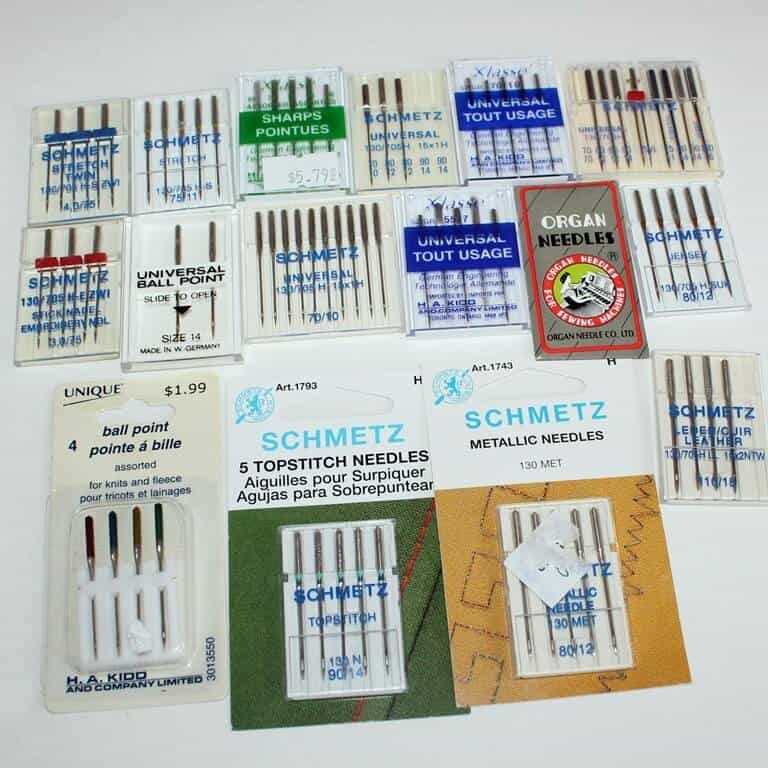 For people who just start to sew it is best to purchase needles of different sizes and types in sets. 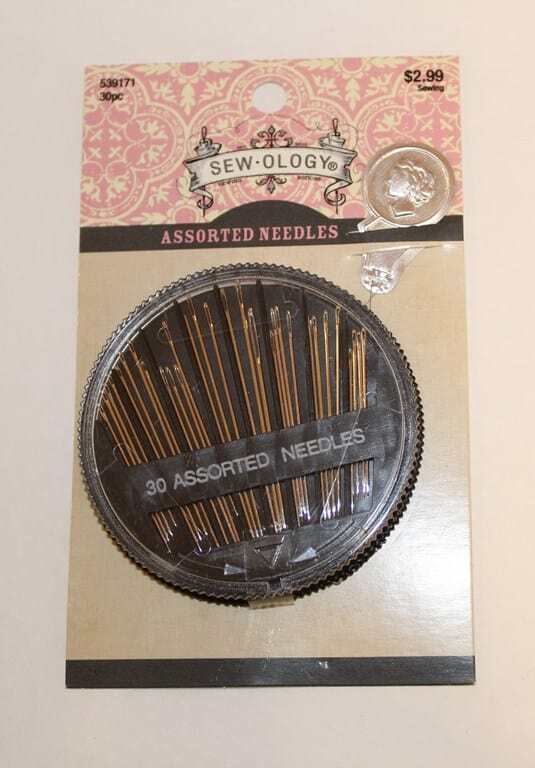 And afterwards choose from the set few sharp long needles with big eyes for basting (you can use them for any lightweight and medium weight fabric), few thicker needles for heavyweight cloth, and few very thin needles for sewing silk. 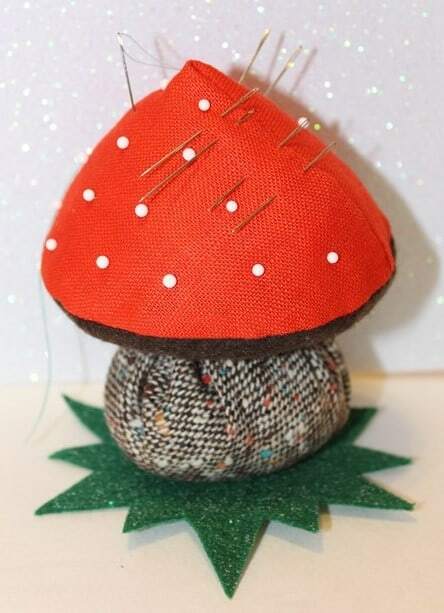 Stick your needles to a nice pincushion – and you are good to go. By the way, don’t forget to count your needles every time you sew. They have a tendency to disappear! And the most disappearing place is the pincushion itself. It is amazing how many needles can get lost inside the pincushion. But not only that. Needles fall down the table without me being aware of it, they hide in the thread spools of different colors, they stick to the fabric I use for a project, and they find their way to any small gap around my place in the sewing room. But I am more thoughtful now. I started to count my needles in my pincushion which I use regularly. Usually, I have 7 of them there. And if at some point I count only 6 I start a serious search to find a missing needle, before my foot finds it for me. Also, I run my needles though the fabric so they don’t stick out from the pincushion and keep some of my needles with threads in them. It helps. Now about other disappearing things – sewing pins and safety pins. 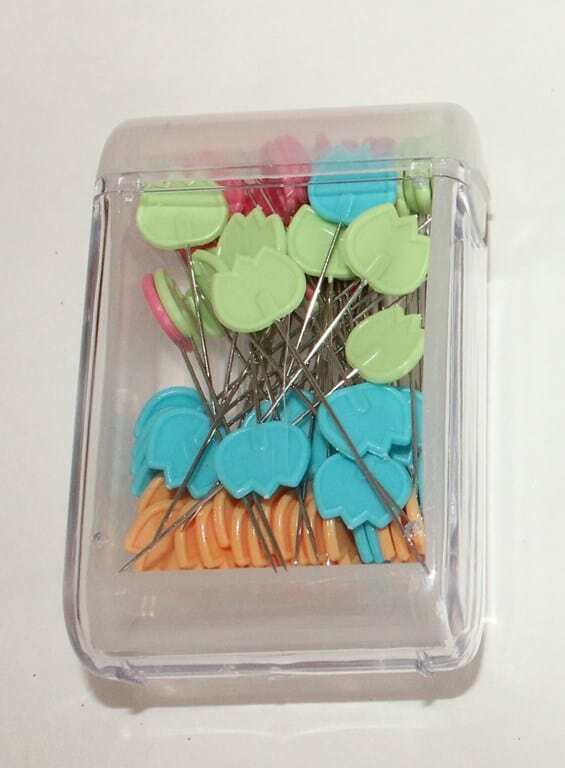 Pins are another important sewing tool that simplifies and speeds up many sewing operations. They are necessary for attaching pattern pieces to the fabric for cutting, for holding fabric together prior to sewing, for fitting garments, etc. They differ in length, thickness and have heads of different shapes, sizes, and colors. They vary from tiny and very thin silk pins to very large upholstery pins. Knowing which ones to use will make a big difference in your project because of the way they interact with the fabric. 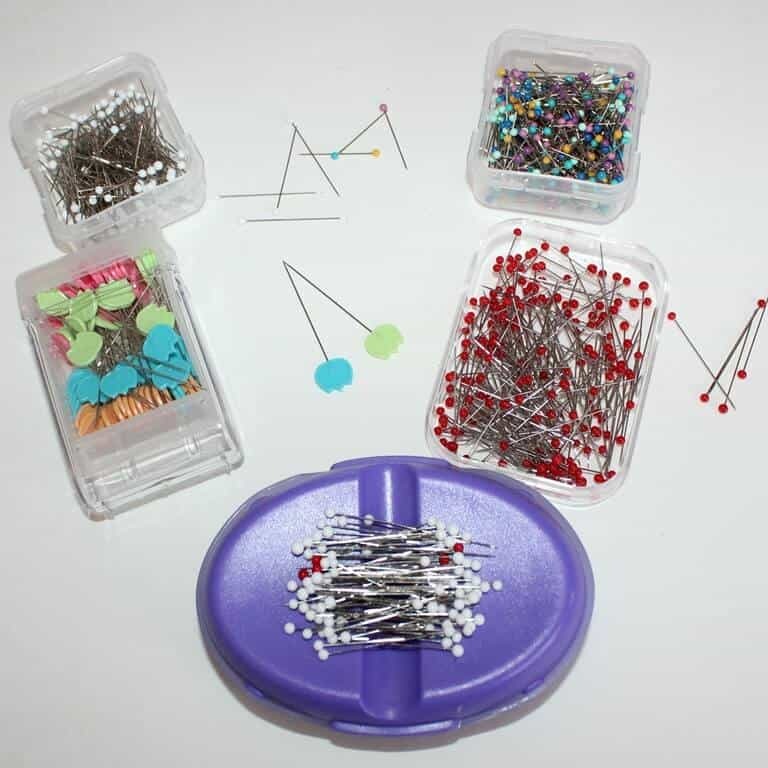 Any experienced seamstress always has at hand more than one set of sewing pins. uy these pins. They are sharp, very thin, long enough, easy to work with and good for any lightweight and medium weight material including fine silk. And for heavyweight fabric buy these pins. When I started to sew I bought these pins which look really nice with their colorful heads. But the quality is really bad. They are thick, blunt and notched. 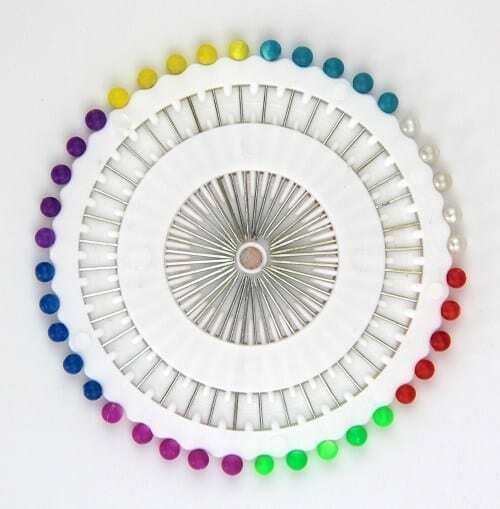 Straight pins commonly have ball heads of different colors made of plastic or glass, but there are pins with a head of a capital letter T, they are used for heavier fabric and usually thicker. Overtime pins become blunted, notched, deformed or even broken and should be replaced with new ones. Be careful with your pins, they are very sharp and you can prick yourself when working with fabric and patterns or when trying to fit the garment. Keep track of your pins. Use a special pin magnet to hold them together or to lift them from the floor. 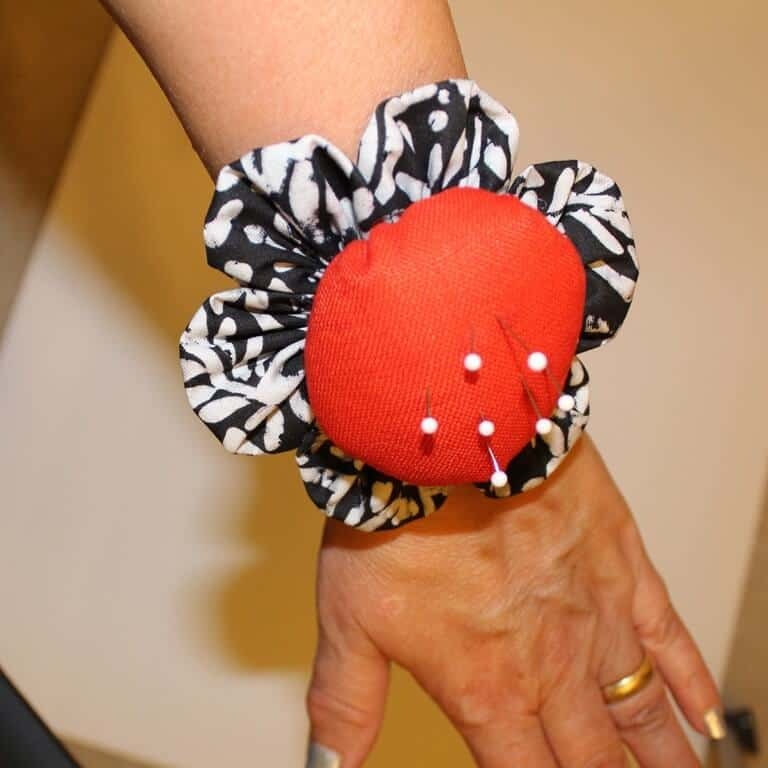 Buy or make a pincushion. I recommend making a wrist pincushion. I found it to be very useful! Do not leave pins in the fabric when you iron it. They can leave marks which are not easy to remove. Do you want to know more? Then read this post by Christine Haynes ( from www.craftsy.com ) 6 Sewing Pins Every Sewist Should Have on Hand. A safety pin is also often used by tailors. 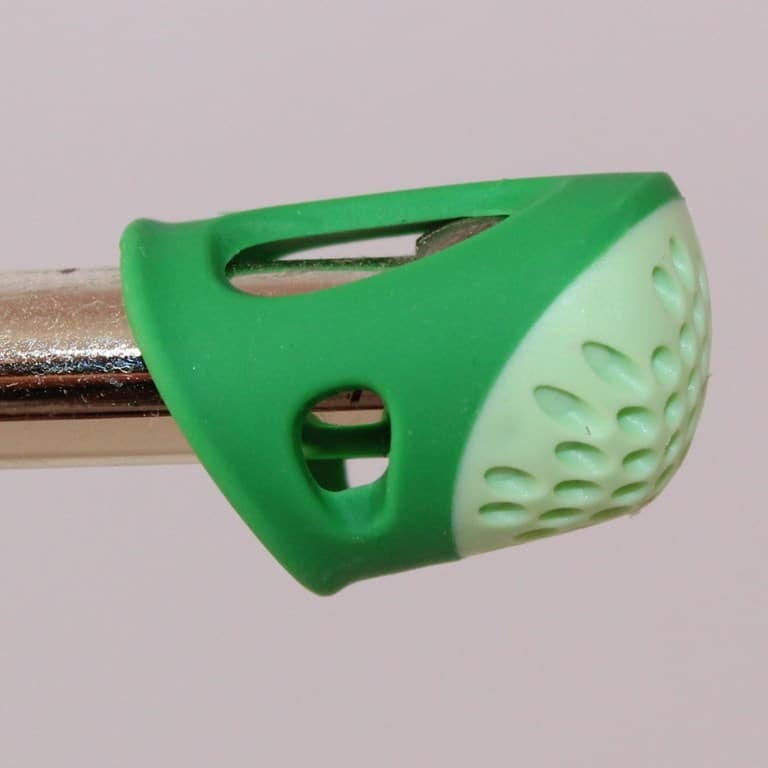 These pins are ideal for inserting elastic into the belt, a cord into the jacket collar, etc. Most likely, you have plenty of scissors at home. Everybody has, right? But are they good enough for cutting fabric and other sewing operations? Certainly not! Never cut fabric with regular household scissors and the other way around: do not use your fabric scissors for household chores. Scissors for paper just don’t work well for fabric. It seems such a small thing, a mere nothing, but it may get you nervous, frustrated and a bad pair of scissors might ruin a piece of fabric. For a good result, sewing has to give you a pleasure, not disappointments. Sewing scissors are very special tools. There are many different types and brands. 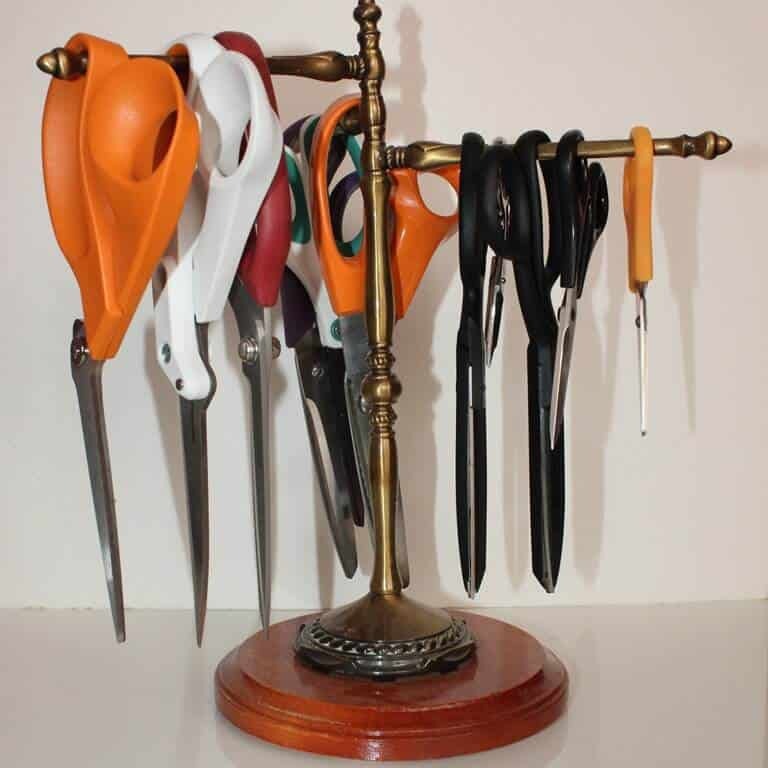 I have a rather large collection of scissors on display. 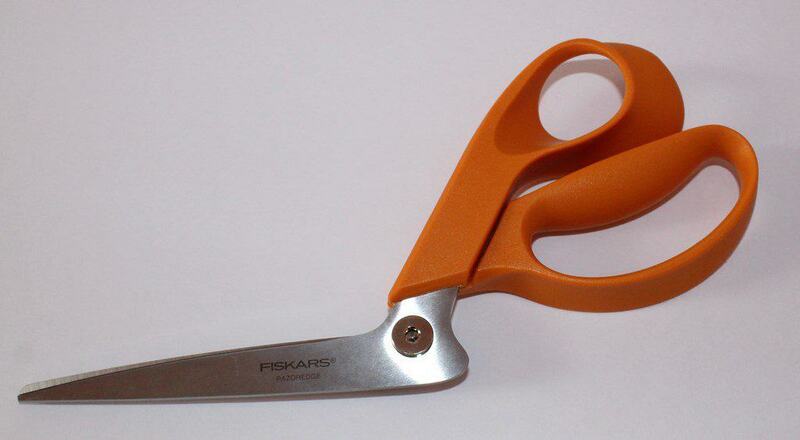 I like very much these Fiskars scissors. 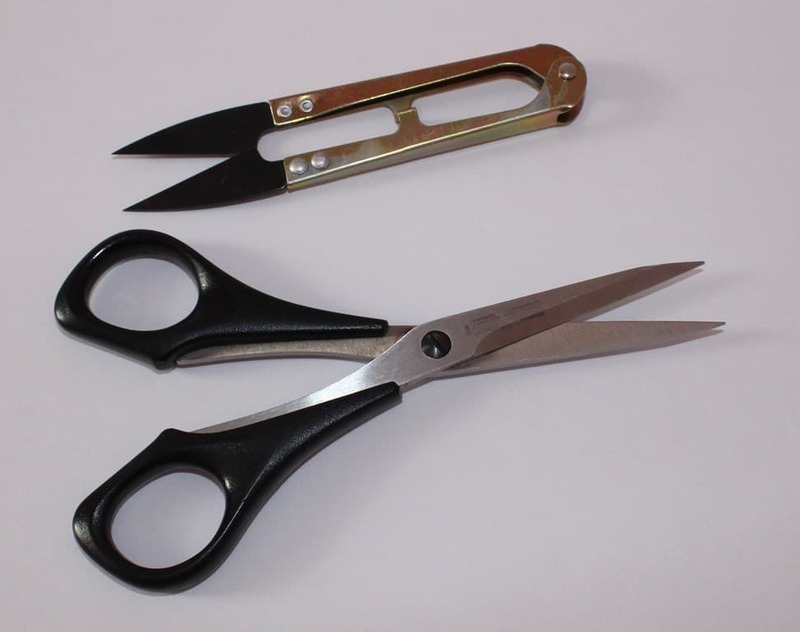 As you see they have angled handles which allow you to cut the fabric without lifting it from the table, they are quite sharp and comfortable for your hand. Of course, they are not ideal and they are also not cheap. But you have to start with something, right? If you are left-handed, buy special sewing scissors for your left hand. High-quality cutting tools are not cheap, but if you treat them carefully, they will serve you for a long time. Don’t drop them, don’t cut paper, foil, and wire with them. Never allow your significant other ( or children ) to use your toys! They are convenient for trimming threads, making notches on the pattern pieces and for some other necessary cutting jobs. A seam ripper is an invaluable tool which helps you to remove quickly wrong stitches without damaging the fabric, and it works better than scissors. It usually comes with a clear plastic cap and a safety ball to protect the fabric from tearing. Purchase also some sewing threads for practice. 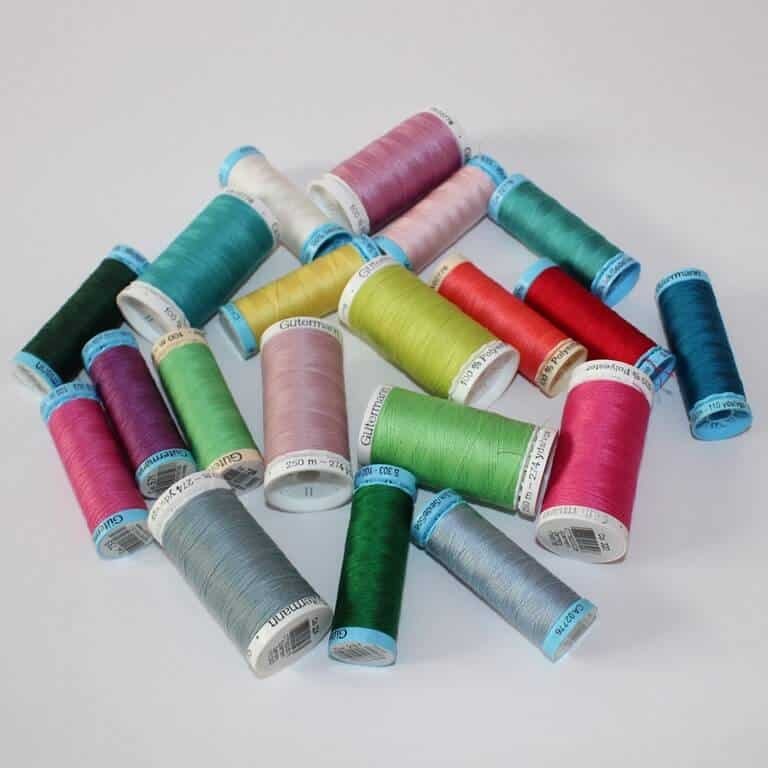 There are many different types, brands and sizes of threads link available: cotton, polyester, pure silk, cotton-wrapped polyester, invisible, water soluble, embroidery, button, basting, serger threads, etc. Usually, we buy threads suitable for a specific project, so the threads match the color and the thickness of the fabric. But from the beginning you will just practice on a piece of cloth without making any project, so few spools of cotton threads of different colors will be enough. Choose white, black and few bright colors so they are in contrast with the fabric you use. Buy only good quality threads. Inferior threads that break easily can drive you crazy. Measures are another necessary tools to have. They are used primarily for taking measurements, but also for construction or adjustment of patterns, measuring fabrics, specifying the length of the garment, marking buttonholes, etc. 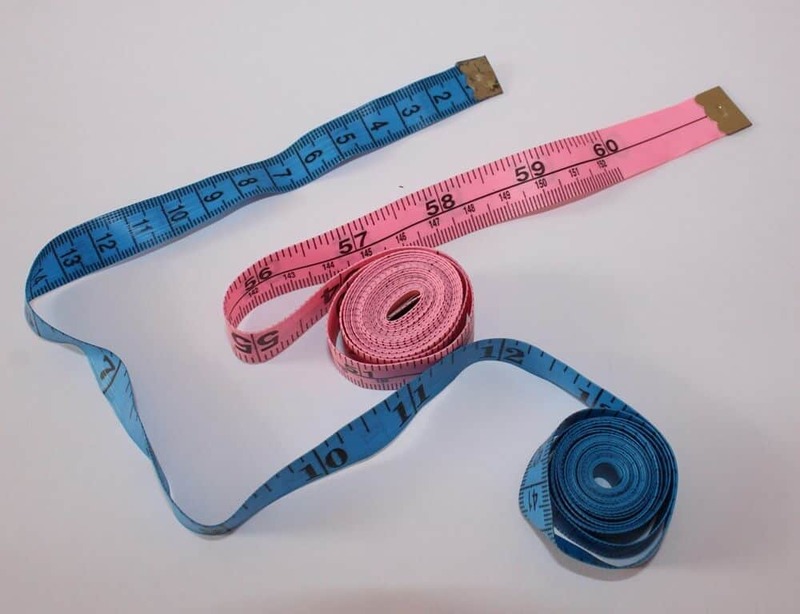 There are different kinds of measuring tapes available. Buy one that has markings in inches and centimeters both and have it always at hand. It is usually a 150 cm (60 in) long tape made of a strong, non-stretch material, with metal rivets at the ends. A thimble protects your finger from needle pricking while sewing by hand. We put it usually on the middle finger of the dominant hand and use it to push the needle through the fabric. Learn to use it by pressing the needle with the side of the thimble, and not the bottom. In the beginning, everybody finds it quite awkward to use. But give it a try – and you will see the difference. The thimble is used if the fabric is stiff, heavyweight, or has a very close weave. Buy a thimble that fits your middle finger. I like to use this one. A needle threader is a must have tool if your eyesight is less than perfect (and at some point, it will be). You can quickly thread a needle with a small eye. Buy this one. It is more durable than the little metal ones and lasts longer. You will need also some marking tools. Sewing chalk allows you to make clear lines on the fabric to mark stitching lines, darts, hems, etc. The drawback of this tool is that the traces of chalk need to be removed from the fabric and sometimes that is not easy to do. Instead of chalk, you can use a flat piece of high-quality soap (mostly white). The soap remnant can be further sharpened with a knife. Marks made with the soap will usually disappear when you iron the fabric. To avoid unpleasant surprises, try soap on a scrap and see whether it leaves stains after ironing. I like to use special markers with disappearing ink. Marks made with it just evaporate from the fabric and don’t leave any stains. You will need also a steam iron and an ironing board. I guess everybody has them at home. So you can start with what you have. If you need to upgrade read this article by Leslie (from www.seasonedhomemaker.com ) The Best Steam Iron for Sewing and Quilting. Personally, I found that a wider ironing board is more versatile. Pressing is often the key to better sewing. Press your fabric before you cut it, and press each and every seam you make. In next tutorials, I will show how to use all these tools effectively. The saying “You are only as good as your tools” is SEW TRUE, when it comes to the selection and use of tools; according to my husband, this is also very true in other areas. You have noticed that there are many choices when it comes to sewing equipment, and no two sewing kits will look exactly the same, although each will most likely contain similar components. 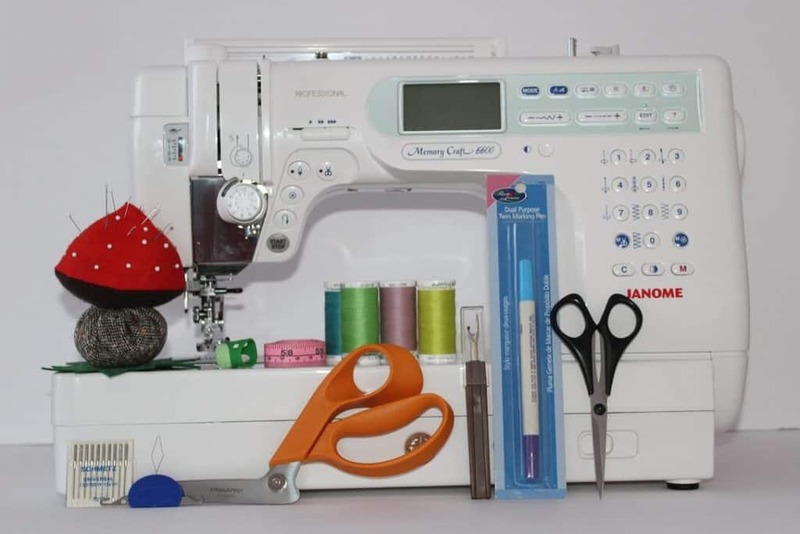 As your sewing becomes more complicated, you will need additional pieces of equipment because every sewing project has unique requirements and tools to achieve your goal. However, if you have the basics, they will continue to be your foundation. Thanks to the wonders of the Internet the task of finding exactly what you need can be easily and quickly accomplished without spending a fortune. Keep your sewing tools well maintained and make certain they stay in good working order and last as long as possible. Do you have any questions? Where do you prefer to buy sewing tools – online or in craft and fabric stores? How much did you spend? Thanks for this piece. I really want to learn sewing but I want to learn at home because I don’t have the time and money to attend a fashion school. I want to know if I can truly learn sewing through internet resources and other reading materials? Please advice. This is such a great article! I’m just starting to sew with a machine (I’ve been sewing by hand on and off for many years). I have a bunch of hand-me-down materials that I’m hoping to use, though I’m nervous that they will not work well and thus make the learning process harder. Any thoughts on this? Specifically, I have old thread (I think it’s nylon), needles, pins, and scissors of various sizes. I plan to get the scissors sharpened, if possible. Thank you so much for your kind words! I am happy to hear that my article was useful. I think old threads are fine, especially if they were made in the USA. You can check if the thread breaks too easily then maybe it is not good anymore. I like to use strong threads though. Imagine this: you spend time and fabric and make something nice – and thread breaks, then your project is ruined, right? Old sewing tools made in the USA (or Germany) may be still good also. You can sharpen scissors in Joann Fabric I think. Or you can buy new scissors when Joann has coupons like 60% off one regular price item. What sewing machine do you have? Good luck with your sewing journey! I will have to put affiliate links in that article, I wrote it before I started to participate in affiliate programs for bloggers. Thank you very much for commenting! You certainly can start learning online. But one article is not enough though. There are plenty of sewing tutorials on Internet. Just google it – “how to learn sewing” or “sewing for beginners”. Also, go to Pinterest. Make some small projects and practice, practice, practice.